Digital & Technology: Leeds has a thriving, and rapidly growing digital sector. Companies range from major companies; including Sky, Sky Betting & Gaming, NHS Digital, Rockstar Games, to a thriving start up scene. The annual Leeds Digital jobs fair is happening on 28th February 2018, providing a great chance to explore this sector further. Retail: In addition to being a great city for shopping, many major retailers have a significant presence in the Leeds City Region. ASDA Walmart’s UK HQ is in Leeds, Burberry’s Business Services are based here, Morrisons HQ is in Bradford, with many other retail chains having significant presence in the region. Manufacturing: Leeds has the 2nd largest number of manufacturing jobs outside of London (Leeds Economy 2017 by Leeds City Council, p. 9). Leeds’ manufacturing base is diverse including, among other things, engineering, print, food and drink and medical devices/technology. 2). That companies in all sectors will employ people in a whole range of diverse roles. For example, a law firm does not only employ solicitors, but will employ people in other core functions such as marketing, finance, IT, human resources, administration and so on. As will organisations in any other sector. The University’s Employability Network was lucky enough to recently have a presentation from Charlie Ball, Head of Higher Education Intelligence at HECSU/ Prospects. Charlie’s presentation centred around dispelling some of the most common myths about the graduate labour market, and was an updated version of some of the material on his blog. In addition to dispelling the myths, he focused specifically on Leeds. Here are some of the Leeds highlights from his presentation. Figure 1 below shows how the graduate jobs market has changed significantly over the past 50 years. Today many graduates work in roles which often did not exist 50 years ago and may not fall into the traditional “professions” (such as teachers, lawyers, medics etc. ), so often students and graduates are not of aware of these opportunities. 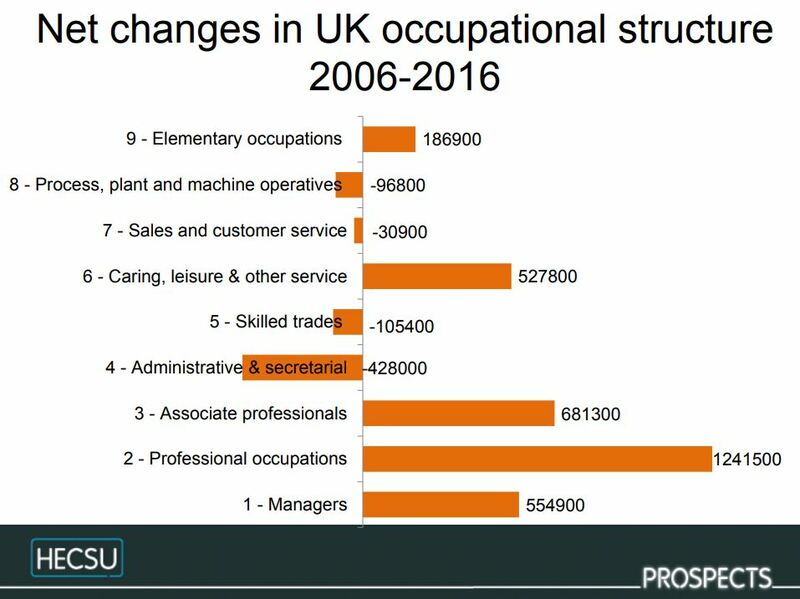 It is also interesting to note, as evidenced in Figure 2, that the 3 types of occupation where there has been most jobs growth over the past decade are all graduate level occupations, contrary to some common misconceptions about the graduate jobs market. Although a great many graduates do begin their careers in London, this is certainly not the only option, as illustrated in Figure 3 below. Indeed, for those graduating (from all UK Universities) in 2016, Leeds is the 5th top location of employment for graduates. Figures 4-6 below, show some common themes in the type of work entered into by graduates nationally, regionally and locally, particularly that Health is a major sector of employment across the country, with business and finance also being prominent sectors. In figure 5, we can see evidence of some of the key employment sectors for graduates in the Leeds region, with particular strengths – besides health – being in Business and Finance, Marketing, PR & Sales, Legal, Social & Welfare, IT, and Arts, Design and Media. Again, there are some similarities when comparing the most common professional level occupations nationally (figure 7) and locally (figure 8); healthcare professions are prominent in both, but we can see when looking at Leeds specifically, that a number of the business and related professions are more prominent. 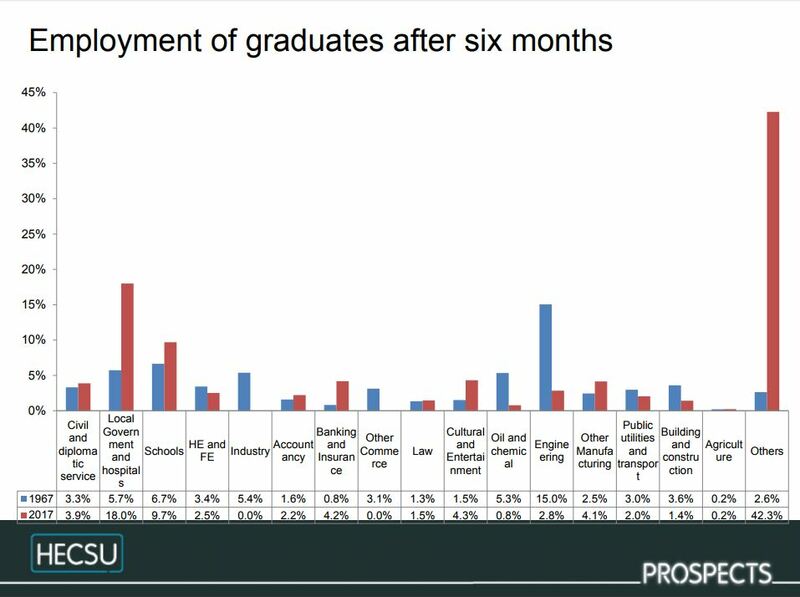 Figure 9 shows the range of ways graduates working in professional jobs in the region found their job, highlighting the value of using a range of different job-seeking strategies in your search. You can find advice on these, and other ways of finding jobs, on our website. Figure 10 shows that of those graduates in professional employment locally, if you exclude hospitals from the equations, nearly half (47.9%) were employed in SMEs, or small to medium-sized organisations. These are those organisations which employ fewer than 250 people. As they are smaller, and generally do not recruit graduates in the same numbers as the larger organisations, their opportunities can be less visible. These figures show however that they are a crucial part of the graduate job market. Take a look at SME-related posts on the blog or talk to us for further advice on tapping into this part of the graduate jobs market. Over the past year, there have been a number of #InLeeds days. These are collaborations between Leeds’ three main universities, Leeds City Council and various businesses in the City. These one-day events offer students the opportunity to find out more about the range of opportunities and organisations in the city, network and develop other key skills. Take a look at #InLeedsDay2017 for a flavour of what happened during last year’s two In Leeds days. Our next event is taking place on the 21st February. Places are extremely limited, so if you would like to take advantage of this fantastic opportunity, apply today. We are here to help you with all things career related, find out how we can help you or talk to us for individual advice and guidance. Great post Jess, good to see some of that data getting an airing.